Its awards season again and Bollywood came up with quite a number of choices in 2007. And yes, this list does not contain Om Shanti Om. The last time you heard the name of this movie on this post was in the previous line. It also does not contain movies like Welcome and Partner as I can’t understand such movies. This year the keyword was – Different. A story which does not follow the trends, where character building is important than putting a dance number to pull the crowds. 15 August would not have been better. As I sat in my seat waiting for the movie to begin, I had my own apprehensions. By the time the movie ended, I pinched myself to make sure that I have actually seen something like this and was not dreaming. The movie was path-breaking in the sense that it opened a new door, a new thought thread which could lead to different movie ideas. It also made a loud point that – Yes, you can have an entirely new plot and don’t need to rehash older plots again and again. Two thumbs up for the daredevil Shimit Amin. 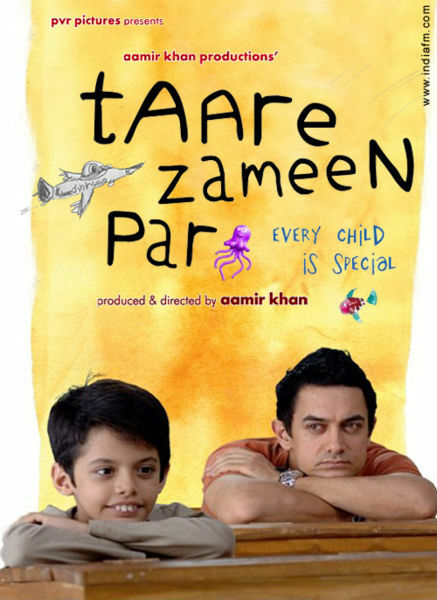 I can bet that this movie can bring tears in the eyes of the most stone hearted person. As the song “hai na maa” started, there was hardly anyone in the theatre who was not crying. I consider this movie as a ray of hope. Its a tight slap on the face of the directors who say that we make movies for money and thus have to cater to the likes of the public. It woke up everyone to the power of the medium, to the fact that a movie can carry a message which can change so many lives. There are so many NGOs which try to spread awareness about dyslexia, but what this movie did in 15 days, the NGOs were not able to do in 15 years. Thanks to Aamir Maverick Khan, the director. Aahhh!!!! the DDLJ of this decade…as I call it. In a span of 10 years one such movie comes which somehow redefines love, underline the fact that a simple movie can be entertaining, the fact that a subtle plot and characterization is required for filmmaking AND the fact that love stories can still be told differently. The only problem as I see it is that this year there is no competition for Kareena in terms of Awards, but Shahid will be having a tough fight. Ironically speaking, this is the Biggest hit of the pair after the breakup. Both of them will be seen again in Satish Kaushik’s Milenge Milenge in 2008. The promos of this movie were so compelling that I had to see it. Again I found it very different and daring too. Its not easy in India to showcase a romantic movie with such a dimension and get away with it. If I let go of the over extended ending, I thoroughly enjoyed every bit of it. There were so many scenes like Paresh Rawal forgetting to zip his trouser after Amitabh tells him that he wants to marry his daughter and the one in which Tabu makes Amitabh run so that she can check his stamina and the one in which Zohra Sehgal keeps asking Amitabh if he went to the gym or not. Too many cooks may spoil the broth. This is what came to my mind as I went for this movie. But the dish was made well and served well too. So many plots but well woven and well shown. Whether it be Dharmendra, Shilpa Shetty, Konkana Sen Sharma, Irfan Khan, Kay kay, Shiney Ahuja, Kangana or Nafisa Ali, everyone had a well etched character to play. The music was composed by Pritam Chakraborty who surprisingly popped up with his band in each song. grrrrr…. Mani Ratnam splashed his talent in Hindi movies after a long gap. Its generally hard to show the life of a person in 3 hours as the director have to jump years, but it somehow worked in advantage for this movie. Abhishek and Aishwarya looked good together, specially as the older couple. 😉 Vidya Balan, Mithunda and Madhavan were perfect for their roles and the songs fitted like gloves. The love story between Vidya and Madhavan was heart wrenching and you actually feel sad for the couple. And thank God someone gave apna Mithunda a “Role” after ages. The real life story of Kiranjit Ahluvalia was well crafted. The public opinion was not too good but somehow the movie stayed with me after I saw it. What Kiranjit went through made me realize that even a smallest person can change the course of the future. Aishwarya was able to bring out the growth in the character from the time she accidentally murders her husband to the time when she faces the judge at the end. The scenes between Kiranjit and her cellmate Veronica were the best in the movie. Nandita Das was as usual great in her cameo. After Khosla ka Ghosla, Rajat kapoor again shined in Bheja Fry. There were no big stars in the movie but it stood on the plot and the cast assembled. Sarika was seen after a long gap and she is still pretty(sigh!). Milind Soman looked like he had just returned from some deserted island where he was marooned from the last 5 years. It was not the usual kind of film, was short and crispy and that is why it was enjoyable . Inspired from the 1987 hit comedy Three men and a baby, Heyy Babyy had something for everyone. Thankfully Sajid Khan’s debut as a director was not as “over the top” as his sister’s. The movie had good performances by Akshay Kumar and Vidya Balan and surprisingly Fardeen was also seen “acting”. 🙂 Angel was very cute and adorable and held the movie together in the first half till Vidya Balan makes an appearance. The movie had some foot tapping numbers by Shankar, Ehsaan and Loy. A crowd of heroines made guest appearance in the title track and Shahrukh appears in “Dil da mamla” which is the highlight of the movie. All in all a complete package entertainer. After being made in Malayalam, Kannada, Tamil and Telugu, the script finally reached apna Bollywood. I went for this movie after people started praising it. Yes, it was spookily surprising. Till the entry of Akshay Kumar the only holding factor was the ghost, but after his hilarious entry, Akshay takes the movie to an entirely different platform. The climax of the movie is a revelation. Just watch out Vidya Balan in the climax and you will surely get gooseflesh. The song towards the end where Vidya imagines herself as the dancer Manjulika is one of the best picturised songs in recent times. 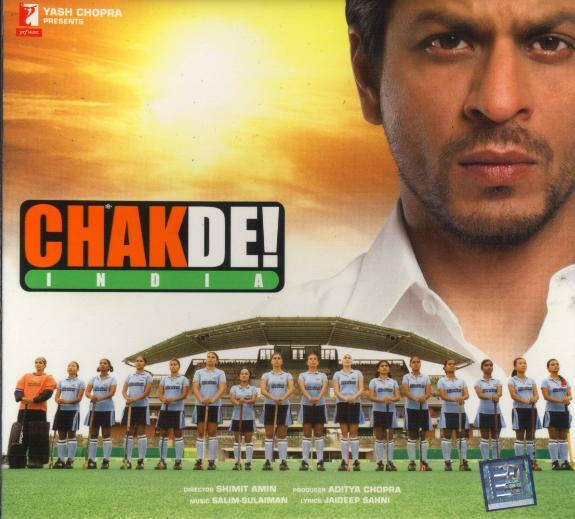 I really liked Chak De and to some extent, Jab We Met because of some crazy dialogues. Otherwise, I’m not really a big fan of Bollywood. 🙂 And TZP failed to impress me totally. First half was ok. Second half was really bad. @Ruhi : YESSSS!!! I finally found someone who didn’t liked TZP, although I loved the movie. 🙂 What about the other movies…have you seen any of them? 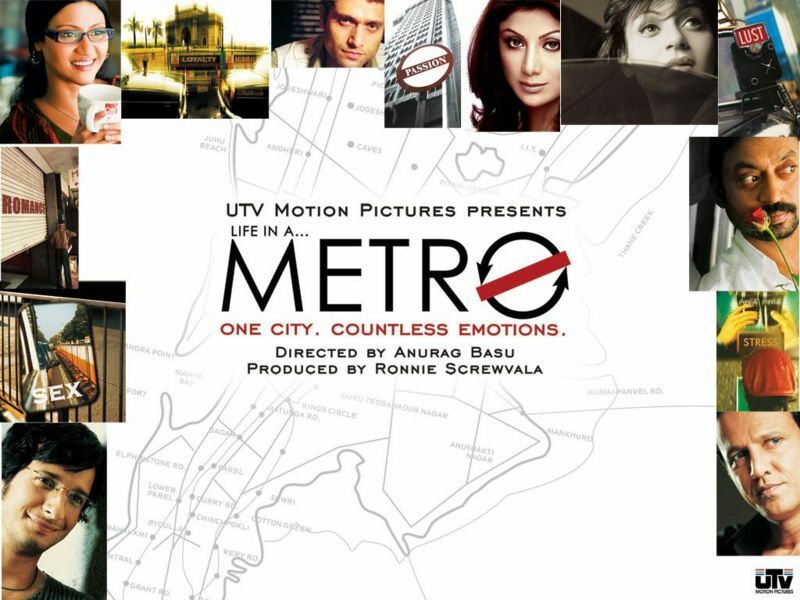 I’ve seen Guru (horrible movie…so I started seeing random scenes) and Life in a Metro (so so…director tried to make it cool; but couldn’t. Irrfan Pathan was the only oomph factor). Btw, feel free to take a look at my cinema page to know what I like 🙂 Also, there was a big debate in my blog on TZP. From the post. you’ll get to know that the 3*9=3 scene is a Calvin Hobbes rip off. @Rajneesh : I can’t remember anything in Welcome except that everyone was shouting and throwing PJs on each other. I asked you to watch TZP, have you seen it yet?? Hey Amit, U forgot to mention Sharukh in Chakde. How can u do this. TZP is not as per my expectations as people around me created too much hype. 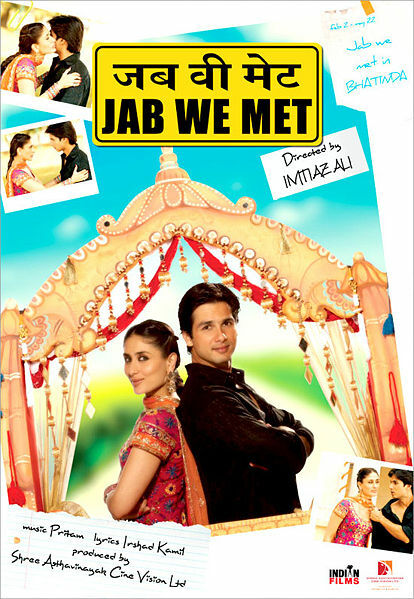 For Jab We Met, credit goes to dialogue writer and I am very big hater of Kareena (Sorry if i hurt u, i saw ur orkut photo too ;). Namaste Londan is ok for me, once watchable. Bheja Fry is good. Hey Babyy first half is good compared to second as i dont like watching vidya. Other movies i havent seen. I think u saw tamil chandramukhi na, can u compare it with hindi flick for me. @Vijaya : Thank god, you are still alive. 🙂 And no I have not seen Chandramukhi yet. I asked you and Sujani so many times but nobody gave me the vcd. 🙁 And yes Chak De had Shahrukh behaving the way I would like him to – Normally. JB V MET :- BEAUTIFUL LOVE STORY & FAMILY MOVIE. SHINY IN THE END.FOOLISH GIRL. BHOOL BHULAITAN :- MINDBLOWING MOVIE. A very good list!!! I would go for the same. The only difference… I dint like Cheeni Kum. @Nova : Why oh Why?? 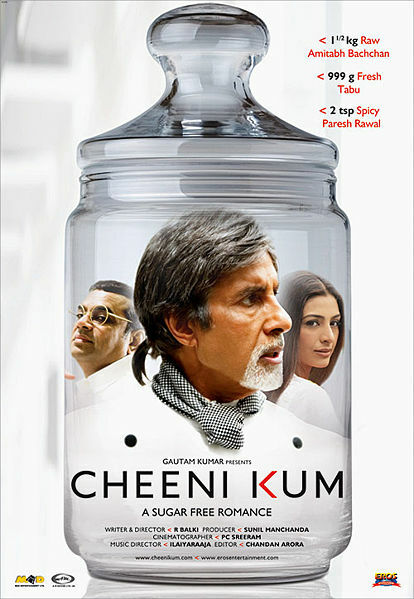 Cheeni Kum was so sweet. Don’t you think?